It was important to us to learn about aging in the Arab Israeli community. 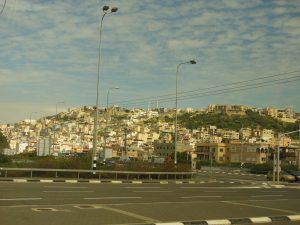 Sakhnin is a city of about 30,000 residents in the Galilee region of Northern Israel. We were fortunate to visit the Sakhnin Elder Day Care Center. When we called the staff for restaurant recommendations in the area, they told us, “We would be terribly offended if you were to have a meal at a restaurant. 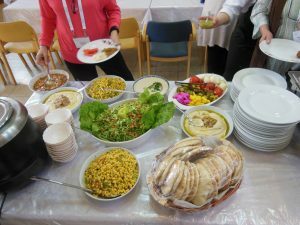 We are cooking a meal for you here at the Center.” When we arrived, somewhat parched after a long drive, we were received with the utmost warmth, and were offered a sumptuous luncheon banquet of hummus, pita, salads, falafel and soup. 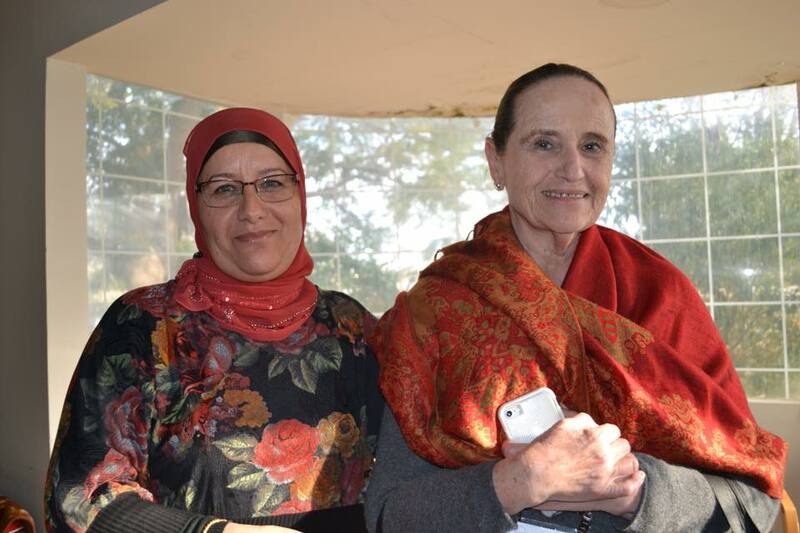 Dr. Rabia Khalilia, professor of Nursing at Tzefat College, and a board member of the Center, presented to us about Caregiving in Arab Israeli families. 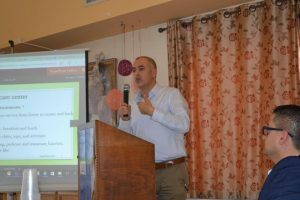 He noted that several intersecting phenomena in the Arab community have combined to created immense stress on individuals who are caring for frail older family members. Specifically, Dr. Rabia pointed to: shrinking extended families; rise in proportion of women who are working outside the home; increasingly complex care needs of the oldest old; and the dearth of pensions among Arab Israeli men, leading to high rates of poverty in old age. Formal supports meet some needs, but many are unmet. Despite the gap between resources and needs, almost all frail elders are cared for at home in the Arab Israeli community; the rate of institutionalization is 1%, compared with 3% among Israelis in general, and 5% in the U.S.
Mr. Rami Salata, a social worker and director of the Center, told us about the work of the Center. They care for 70-90 elders/day, including a small group of elders with dementia. Participants receive two hot meals, shower, laundry, recreation, and social work support. Men and women eat together, but their activities are separate. Women do crafts, and discussions; men play cards, backgammon and mancala, paint, and read Koran. Funding for the center comes from social security and the Ministry of Welfare, and is augmented by grants from private foundations and the JDC. We were taken on a tour of the Center’s facilities, including a lovely garden where participants care for flowers. We were impressed with the tenderness and commitment of the staff and board. It was abundantly evident that the warm welcome that we received is offered to each and every participant every time they come to the Center.